When you think of scoliosis, you may recall yearly spine screenings by your grade school nurse, or remember demonstrating how close you could come to touching your toes during your annual checkup with your pediatrician. What you may not have realized is that during these exercises, healthcare professionals were searching for signs of a serious spine condition that, if left untreated, could lead to a number of health problems later in life. Scoliosis is a sideways curve of the spine, which can make the spine look like an “s” or a “c” rather than a straight line when viewed from the back. Although scoliosis can develop at any age, I typically see patients during adolescence, when most children are growing rapidly. Scoliosis can quickly worsen during this growth spurt, making early detection and intervention essential. In adolescent patients, spinal fusion surgery is very effective in correcting spinal deformity caused by scoliosis. This surgery permanently connects two or more vertebrae in the spine to correct the curve. However, younger patients may not be good candidates for spinal fusion surgery, as their spines need to continue to grow to support their lung size and function. 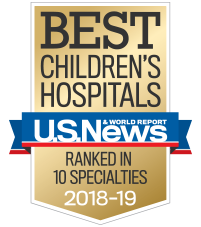 At Children’s, many of our young patients have seen success with spinal growing rods, which allow the spine to continue growing while controlling curve progression until the child is old enough for spinal fusion surgery. Growing rods are surgically attached to the spine and magnetically controlled by an external remote. Every three to four months, the rods are lengthened to keep up with the spine’s growth. Once a child is older and the spine has grown, the doctor will remove the rods and perform a spinal fusion. So, what does severe scoliosis look like and how do these growing rods help? The X-rays below show the progress made by a few of our young patients. Early detection and treatment can save your child from a lifetime of disability and other health concerns associated with scoliosis. Visit our website to learn about the signs of this spine condition. If you think your child might have scoliosis, please don’t hesitate to schedule an appointment with your child’s pediatrician.